Ok, you might not have the desire or the time to read through all of these reports when researching a prospect who owns a farm or ranch, so I will point out a few changes from last year and try to give you some insights into an extremely diverse and difficult group of prospects to research. Overall the market is steady with no drastic changes other than a lower supply of available properties. The market activity for farm properties driven exclusively by agricultural production with no alternative uses, such as recreation, generally saw less activity in 2016. Farm values averaged $3,010 per acre; highest in the Corn Belt region at $6,290 per acre and lowest in the Mountain region at $1,110 per acre; down slightly from 2015. This is the first decline since 2009. Keep in mind these prices vary depending on the quality of the land. The only thing that swings pricing one way or the other is subjective points of view. Price per acre is personal to each property and is affected by quality, location, aesthetics, water resources, soils, wildlife and a multitude of other attributes that are hard to accurately measure. The USDA reports are averages; there is a lot more to it than that which is why appraisals are so difficult to analyze. More specific land values reported by the National Agricultural Statistics Service can be found here. 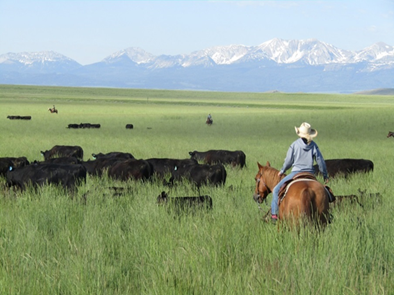 The demand for ranch properties, ones in which produce beef or have more pasture ground compared to crops, driven exclusively by agriculture production, also fell off. However, investor interest remained very strong. This group, looking for solitude, safe haven investments, or just to showcase their wealth, are seeking out properties with solid agriculture production capabilities, good recreational opportunities, and scenic amenities. Properties used exclusively for recreation also saw in increase in demand. It can be very helpful to find comparative properties (“comps”) just like you would with any other real estate property. You can find comps on many different websites across the county. Hall and Hall, which serves as the largest full-service land brokerage in the country, is a great resource and deals with large and small farms and ranches across the country, providing great detail about their listings. Estimated net farm income ($62.3B) for 2017 is down 9% from 2016; continuing a four year trend. Farm wealth is also expected to decline for the third year in a row. Commodity prices are still low; therefore farm income continues to decline and is forecast to drop again in 2017; bringing it to its lowest point since 2002. All of this suggests a weakening financial picture for the agricultural sector as a whole. If you’re interested in more specific stats about a particular state, such as number of farms, income, commodities produced, use this handy tool. Or, if you want even more detail, this tool will provide an overwhelming amount of information for each state; news releases, agricultural overview, special interest reports, crop progress and condition, and ag census data. If you’re interested in learning more about large landowners, The Land Report provides news, information, and insight into America’s land. Here are the 2016 Top Ten Landowners (there are actually 100 on the list) and some interesting facts about each. Named a “Citizen of the West,” Malone gave $42.5M to Colorado State University in 2014 to develop stem cell and other treatments for animals. Turner Ranches manage over 51,000 bison across all of its ranches; they recently sold the 43,000-acre Bluestem Ranch in Oklahoma to the Osage Nation for $74 million. Owners of Sierra Pacific Industries, their sustainability practices include planting over six million seedlings each year and utilizing wood waste to generate more than 150 megawatts of electrical power via eight state-of-the-art cogeneration plants. Owner of the Los Angeles Rams, the Denver Nuggets, and numerous other sports franchises. Kroenke recently purchased the famous Waggoner Ranch in Texas, the largest contiguous ranch in the United States with a record breaking asking price of $725M. Teledyne cofounder Henry Singleton (1916–1999); The family’s San Cristobal Ranch has run cattle just south of Santa Fe for many generations. Founder of Commonwealth Brands tobacco company, his largest ranches include Texas Mountain Cattle Co. and Spanish Trail Land & Cattle Co. In 2012 his Calumet Investment Trust paid almost $36 million for one of thoroughbred racing’s most hallowed grounds, Calumet Farm. Owners of the famous King Ranch in Texas, they also own ranches in Florida. King Ranch covers over six counties and is divided into four parcels providing fertile land for raising and training cutting horses. Land ownership has always been an expression of wealth. Some of us will be lucky enough to research an individual who is a large landowner and just know that we have a major gift prospect in front of us, but others may just look like the guy or gal next door. Getting an overall sense of the industry, its diversity, and knowing where to find the data you need to make a decision will certainly help you when determining capacity.